Former Under Sec. of State and U. S. Ambassador to the United Nations under President George W. Bush, John Bolton (Trilateral Commission, Bilderberg, Skull and Bones and CFR insider) told Hannity at Fox News the standoff between the U.S. and North Korea is “our day’s analogy to the Cuban Missile Crisis… I don’t think we really have confidence we know what Kim Jong Un and his generals will decide… that’s one of the reasons why if there’s going to be military action, it ought to be sooner rather than later… this situation …continuously gets worse and more dangerous (August 10, 2017).” Bolton is correct about the danger and uncertainty of what Kim Jong Un will do; however, this is no Cuban Missile Crisis. 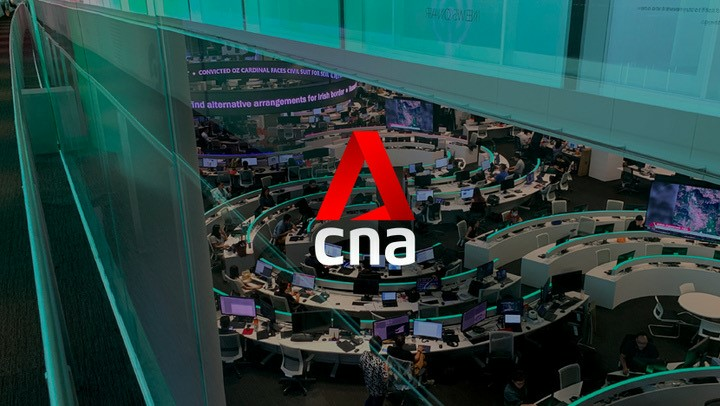 The following sections will explain briefly the Cuban Missile Crisis (CMC); Castro; Bush and Obama’s failures; the North Korea Crisis (NKC); comparison of Jong Un to Castro; why CMC is not NKC and some solutions. Late 1945: ‘Big Three’ – United States, Soviet Union (Russia) and United Kingdom has control over Easter Europe and the Cold War begins after Yalta Conference. 1946: Russia’s Czar Stalin says communism and capitalism are incompatible; President Truman demands for Russia to leave Iran. 1960: On intelligent that Castro regime was threating Central America and the U.S., President Eisenhower ordered the CIA to develop an invasion plan. April 1961: CIA funded counter-revolutionary Cuban exiles and US troops invade Cuba at the Bay of Pigs; within 3 days Castro’s Cuban Revolutionary Armed Forces defeat them. The 1,500 troops versus over 200,000 did not move the people to a coup. October 26: Khrushchev responds with letter to Kennedy with a proposal; in part never to invade Cuba in return for missiles being removed. October 28: U.S. agrees to remove US nuclear missiles from Turkey; Soviet Union dismantles and began to remove missiles from Cuba. The Middle East has been a fluid situation for centuries, but especially since the end of World War II and Israel becoming a state in 1948. In 1945 the League of Arab States formed and in 1964 certain Arab leaders created the Palestine Liberation Organization (PLO). Other Muslim organizations came to varies degrees of power and influence, including the Muslim Brotherhood (1928), Fatah (1964), HAMAS (1987), Al-Qaeda (1988), the Taliban (1994) and ISIS (AQI/ISIS/IS 1999/2004). Several major Arab-Israeli wars and conflicts took place over territory, primarily from 1956 to 1990. As stated previously, NATO formed in 1949 and the Warsaw Pact in 1955. During the Korean War (1950-1953) and Vietnam Wars and conflicts (1957-1975) the world saw Russia supporting the north and the United States the south. And that has not changed much. In 1991, the USSR dissolved and their Collective Security Treaty Organization (Alliance) formed in 1992 breaking up the Soviet Union; leaving Russia in tact but Kazakhstan and other nations gained independence. In order to discuss territory situations Russia, China and three other countries began Who is the Shanghai Cooperation Organization (SCO)? in 1996. In 2005, Russia, China and other member states of the SCO took part in joint military wargame exercises. In 1979, 66 hostages were taken in Iran after the US Embassy in Tehran, Iran was seized; it took the Carter administration 444 days before they were freed. That year, Saddam Hussein ousted Al Bakr and assumed his position as President of Iraq. In 1980, Iraq attacked Iran and the conflict continued until 1988. In 1981, under President Reagan (1981-1989) the National Debt hit $1 Trillion and the top tax bracket was reduced from 70% to 50%; while during his 8 years the National Debt increased 186%. In 1990, the National Debt reached $3.5 Trillion and the top tax bracket was down to 28% under George Bush (1989-1993). In 1990, Iraq invaded Kuwait and threatened US partially owned oil reserves. A U.S. led coalition came to Kuwait’s defense in Desert Shield/Desert Storm (1990-1991) where about 700,000 U.S. service members were deployed to the Gulf. The Gulf War began in August 1990 (292 US troops killed; 4,200 Kuwait troops; and about 30,000 Iraqis). After part one of the war, in April 1991, the United Nations passed Security Council Resolution 687 authorizing inspections in Iraq looking for chemical weapons. In 1992, Iraq declared in did have 89 missile and chemical weapons but destroyed them. Iraq remained under tough economic sanctions. Inspections and protest against sanctions and inspections continued until December 1998 (at various times biological warfare facilities were discovered) when Iraq halted cooperation. In 2003 the United States and coalition forces invaded Iraq and after 8 years (2011) the U.S. began to withdraw troops. President Obama said in a campaign debate that he would immediately withdraw troops – that promise was made in 2008. From 1990 to 2009 the National Debt increased from $3.5 Trillion to $12 Trillion (under G. H. Bush – 54% increase 1990-1993; Clinton – 1994-2001 increase of 32%; G. W. Bush – 2002-2009, 101% increase). The top tax bracket increased to 39.6% to offset growing War debts. In 2009, Obama took office and continued the Afghanistan War until he left office in January 2017. The National Debt increased $9.3 Trillion from $10.6 Trillion to just under $20 Trillion during Obama’s 8 years; nearly doubling all previous Presidents. In 2005, the United States was denied observer status in the Shanghai Cooperation Organization (SCO). That same year India, Iran and Pakistan were allowed observer status in the SCO and China-Russia held their first anti-terror military exercises. By 2017, the US remained barred from SCO observer status, and the group was at 8 member states (including Russia, China, Pakistan and India) and at least 5 observer or dialogue countries including Afghanistan, Iran and Turkey. 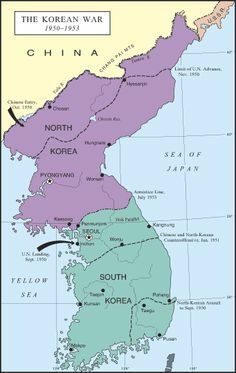 By the end of the Korean War in 1953, about 2.5 million people were killed and Korea was split into two. In 1964, China developed its first nuclear weapon. In 1972, Communist backed Comrade ‘Supreme Commander’ Kim Il Sung (founder of the DPRK) became the Premier of North Korea. In 1994, he was declared the ‘Eternal President of the Republic.’ In 1991, Kim Jong-Il took the position as Supreme Commander of the KP; and in 1994 Supreme Leader (his older brother died months earlier). Jong-Il ordered the destruction of between 500 and 2000 Christian Churches and Buddhist Temples; although his grandfather was a Christian. In 2002, President Bush called North Korea part of the ‘axis of evil’ along with Iraq and Iran. December 2011, Kim Jong-un (2nd son of the 3rd wife) became North Korea’s Supreme Leader after the death of his father. Kim Jong-Il is declared ‘Eternal General Secretary.’ By 2014, the United States was at about 7,200 nuclear weapons; Russia at 7,500; UK at 215; France at 300; China at 260; Israel at 80; India at 100; Pakistan at 100; and North Korea 7. By 2017, the Kim Dynasty reached 70 years old; and the Castro Dynasty 68 years. Under the Kim Dynasty between tens of thousands and several hundred thousand North Koreans were imprisoned, raped or killed for religious or political reasons; and since 1995, it has been said over 1 million starved to death under the regime. In 1985, North Korea joined the Nuclear Non-Proliferation Treaty (NPT); yet, by 1997 had missiles and pulled out of talks with the United States. In 1998, they fired their first long-range missile over Japan. And in 2003, North Korea withdrew from the NPT after reaching nuclear weapon capability. Before World War II ended the Japanese occupied Korea. After the war, like in the Middle East, the Korean peninsula suffered conflicts and civil war over who would control what territory. Russia backed the northern portion and the United States the south; and China would have liked to whole peninsula, but had its own reconstruction and power issues on their side of the Yalu River. In 1948, the Soviet Union (USSR; Russia) declared Kim Il-sung (former commander of the Soviet 88th Brigade of Chinese and Korean exiles) the Premier of North Korea (DPRK). In 1950, Kim became the Supreme Commander of the Korean People’s Army. 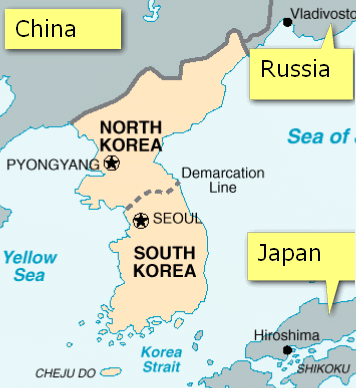 That year, South Korea declared independence from North Korea, leading to civil war – the Korean War. In 1991, North and South Korea joined the United Nations; and in 1994 Kim Jong-Il became the Supreme Leader of the Democratic People’s Republic of Korea (DPRK) – which is under a communist dictatorship. In 1996, thousands of North Korean troops enter the demilitarized zone and set up stations. In January 2002, President Bush called North Korea part of the Axis of Evil. Later that year 34 were killed in a naval battle between the Koreas. In 2011, Kim Jong-Un took over the dictatorship. In 2012 and 2013, among Jong-Un’s ordered executions were his Vice Minister of the Army (executed by mortar round), his ex-girlfriend (by firing squad) and his uncle for an attempted coup. In 2013, the Hudson Institute reported that “for 50 years, its (N.K.) 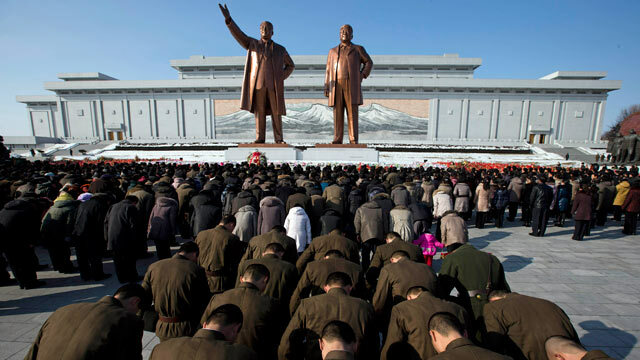 secret police has waged a brutal campaign to eradicate religious belief…” February 2017, The Guardian reported that Kim Jong-Un ordered the execution of about 140 senior officials. Statistics of Democide and South Korea’s Overseas Information Agency, estimated between 700,000 and 3.5 million people have been murdered under the Kim Dynasty dictatorships. In 1985, North Korea joined the Nuclear Non-Proliferation Treaty (NPT) and by 1993 the International Atomic Energy Agency cited North Korea for being in violation of the NPT. In 1994, N.K. bargained in return for nuclear reactors (for energy production of course) they would freeze their nuclear weapon program. In 1998, N.K. test-fired the Taepodong-1 missile and in 2003 pulled out of the NPT; in 2003 they had enough nuclear fuel rods for 6 to 8 nuclear bombs. September 15, 2005, the U.S. Treasury froze about $25 million in North Korean funds, using the money laundering section of the USA PATRIOT Act. September 19, 2005 in six-party talks, North Korea committed “to abandoning all nuclear weapons programs.” In 2006, North Korea test-fired 7 missiles and in 2009 another 8; that was a total of 16 under Kim Jong-Il in about 11 years. Kim Jong-Un was been much more aggressive: test-fired 2 in 2012; 6 in 2013; 19 in 2014; 15 in 2015; 24 in 2016 and so far 18 by mid-August 2017. About 75 missile launches were done during the Obama Administration. March 21, 2007, during 6th round of Six-Party talks the U.S. agrees to return the $25 million in frozen funds. October 2007, the Bush Administration agrees to give N.K. almost a million tons of heavy-fuel oil for continued cooperation. April 2008, the CIA briefed certain Congressmen that N.K. had assisted Syria in construction of a nuclear reactor. The Syrian facility was destroyed by Israel. In 2009, as Obama came into office, the North Korea Six-Party talks entered its 6th year (China, Japan, N.K., Russia, S.K., U.S.). North Korea launched at least 74 missiles during Obama’s 8 years. August 2009, the UN in accord with Resolution 1874 continued to discuss the failed sanctions policy. December 2009, the government of Thailand seized 35 tons of weapons from a North Korean plane that landed in Bangkok on its way to the Middle East. March 2010, a South Korean patrol ship was sunk near the maritime border. July 2010, the U.S. imposed more sanctions due to the event. In September 2010, former and aged President Jimmy Carter said North Korea has sent “clear, strong signals” that it wants to restart negotiations. (He should know that there are many evil, cunning and deceiving adversaries in the world.) November 23, 2010 N.K. fired artillery rounds at the South Korean island of Yeonpyeong, killing 2 soldiers and injuring 17. China called for an emergency Six-Party talk; and the U.S., Japan and S.K. rejected. No one made them pay for their act of war or terror. 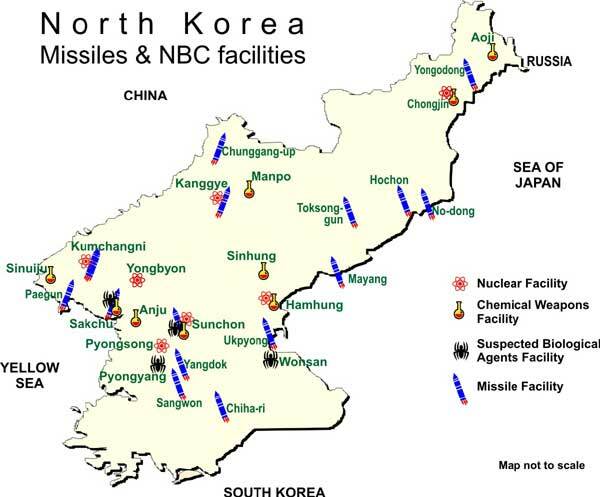 February 2011, Director of National Intelligence James Clapper reported that North Korea had undeclared uranium enrichment facilities. 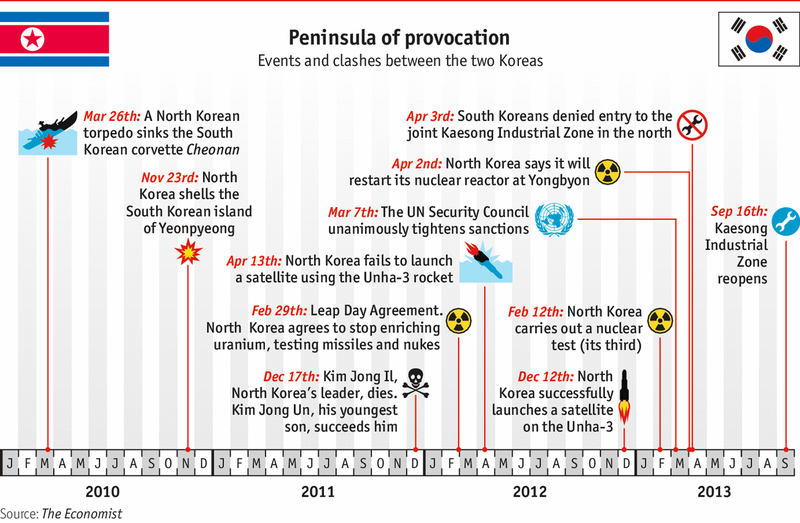 February 28, 2011 the U.S. and S. Korea conduct joint military exercises and North Korea threaten that if tensions rose it would turn Seoul into a “sea of fire.” April 2011, Obama issued an executive order reaffirming a ban on N.K. imports. June 2011, U.S. warships forced a North Korean freight vessel to return course; it was carrying missile components to Burma. 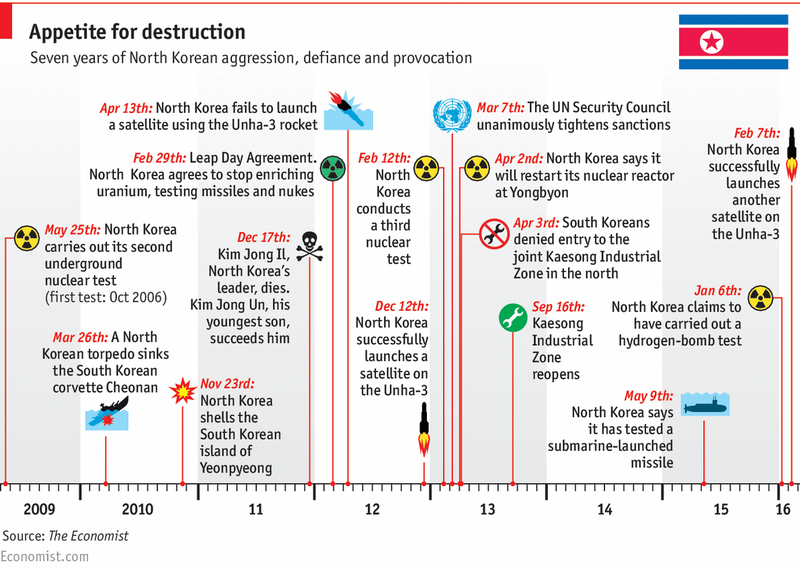 December 29, 2011 Kim Jong Un was declared N.K. Supreme leader. 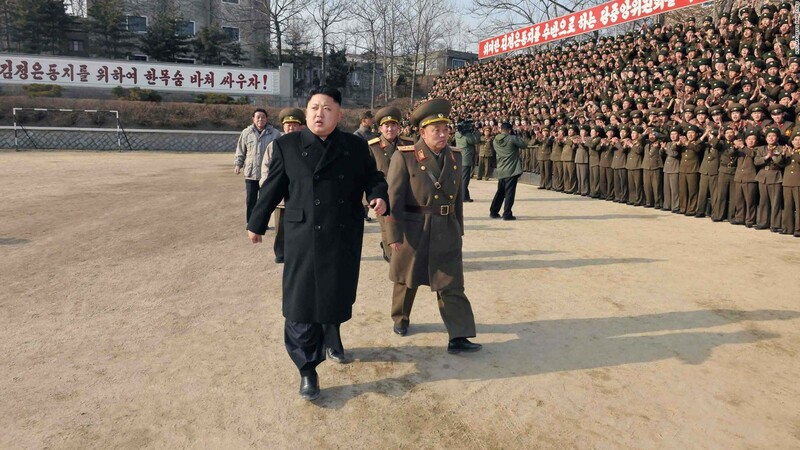 February 2012, in return for more weak promises, the U.S. gave N. Korea 240,000 metric tons of food aid. February 2013, the CTBTO detected activity at a N.K. nuclear test site. North Korea continued to launch missiles. March 8, 2014, China declared a ‘red line’ saying it would not permit war on the Korean peninsula. March 21, N.K. test-fired another missile. July 4, North Korea launched a KN-14 ICBM, and Trump said in part, “…Does this guy have anything better to do with his life? Hard to believe that South Korea and Japan will put up with this much longer. 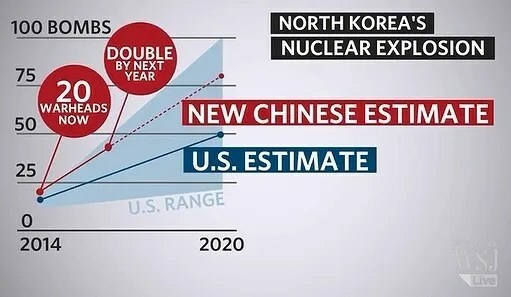 Perhaps China will put a heavy move on North Korea and end this nonsense once and for all!” July 5, United Nations Ambassador Nikki Haley told North Korea ‘time is short; action is required’ and that their actions are “closing off the possibility of a diplomatic solution.” In addition to the previous sanctions placed on North Korea up through 2016, certain U.S. and U.N. officials were still looking at sanctions to solve this Crisis. July 28, 2017, Kim Jong-Un ordered the launching of another KN-14 Intercontinental Ballistic Liquid-fueled Missile. Early August sanctions threaten N. Korea with the loss of about $3 billion in trade primarily with China. August 7, North Korean officials reporter that it would take “thousand-fold” revenge against the United States. August 8, North Korea’s KCNA News reported that the government was considering an “operational plan” to “send a serious warning signal to the U.S.” by firing Hwasong-12 at or near Anderson Air Force Base in Guam. August 8, 2017, after North Korean criticism of U.S. words and U.N. sanctions, President Trump told reporters that “North Korea best not make any more threats to the United States… They will be met with fire and fury like the world has never seen.” About the same time, U.S. Defense Secretary James Mattis warned the North Korean regime that the “end of its regime and the destruction of its people” would come if they continue actions such as wanting to fire missiles around Guam. August 9, North Korea again issued a statement it was considering creating an “enveloping fire” around Guam. General Mattis responded that they are “grossly overmatched (and) would lose any arms race or conflict it initiates.” August 11, Trump tweeted that “military solutions are now fully in place, locked and loaded, should North Korea act unwisely. Hopefully Kim Jong Un will find another path!” August 2017, Guam and Japan prepare for possible war; together they are home to over 200,000 Americans. Despite the “ever-alarming rate” of weapon grow in North Korea and that America’s “strategic patience” is over, the Director Pompeo of the CIA said August 13 that there is no imminent threat of a nuclear war with North Korea. 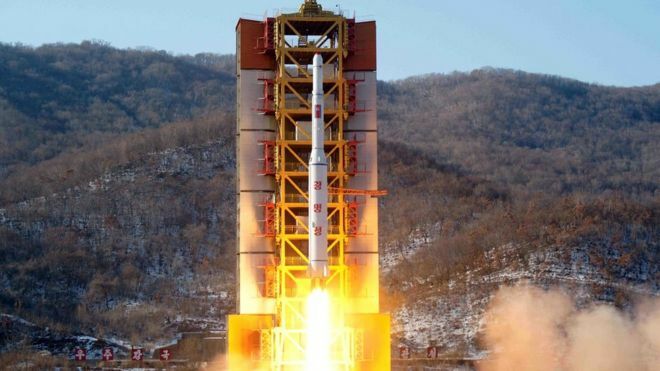 The North Korean Crisis (NKC) is not like the Cuban Missile Crisis (CMC) in many significant ways. The time was different in technology, communications and militaries. There was not instant satellite surveillance; neither instant multi-media communications (although obviously America and Russia had constant phone and fax ability); nor the web to show leaders their every tweet; and as to militaries only Russia and the United States had nuclear weapons. Now North Korea has them and Kim Jong Un is their Supreme leader at the moment. Castro never had the nuclear bargaining chip in such a way – not hundreds of missiles and about 8 nuclear warheads ready to say we want a sit at the table. Additionally, during the CMC it was Russia and the United States negotiating and Castro was yielding to its military backer and trade partner Russia. Also, Russia and America was able to reach a nuclear compromise – Russia pulls the nukes from Cuba and America does from Turkey. N. Korea has no such negotiator as did Cuba. 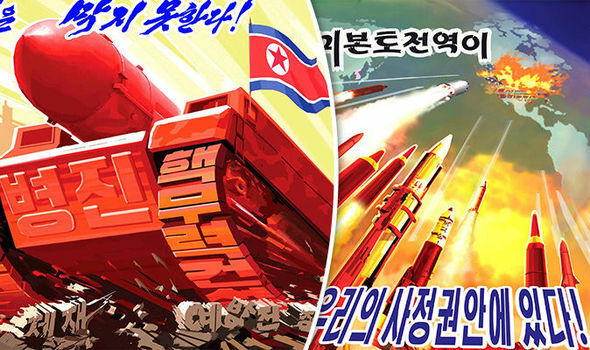 In the NKC there is no ability for such an agreement; neither party will pull nukes from their present nation. Not from the United States, nor from its NATO alliances (they would not agree anyway), nor from any other strategic location; and thus, North Korea will continue to move toward keeping and building up its stockpile. And what NK agrees to dismantle will only be for show. Furthermore, Castro was a dictator that persecuted his people and held his rule for the longest of any current dictator; and the Kim Dynasty has likewise. CIA psychological profiles listed that Adolf Hitler suffered from ‘hysterical blindness and… an expert in calculated bluffing,’ but reported Nikita Khrushchev of Russia was a “typical pragmatist,’ and that Castro of Cuba was ‘not crazy;’ but was unstable and neurotic. Though Castro was reported to ‘need to rebel,’ his ‘ego’ and ‘hunger for power’ in his region made him yield to Khrushchev. Castro wanted to live and to be recognized by the masses. Kim Jong Un of Korea has selfish-ambitions, loves and constantly desires recognition and approval; the N. Korean grade school books are filled with his miracle fits – shooting 38 under par on 18 holes with about 11 holes in one, yacht racing at 9 years old, and writing 1,500 books in 3 years at University. We know Kim Jong Un, like his father, has no problem with lying or changing his promises. He also has a strong desire for totalitarian rule – to be a 3rd generation dictator and the eternal leader of Korea – likely all of Korea. He has no problem ordering executions of family or past lovers. He does not desire many heirs or children as did Castro – he is more self-centered. He has no problem defying the United Nations or any nation to get to where he wants – to have the big Nuke sticks. He hates the United States and that is not likely to change. Though he hugs and smiles with his subjects; he places little value on the life of his very own troops and citizens. Many recently say he is patriotic, ‘paranoid,’ moody and desires to be remembered like his father and grandfather. Older psychological profiles said Kim Jong Un was rational; but newer 2017 profiles find that he could very likely push the nuclear button. Put more sanctions on N. Korea, with China on board – this will not work; just as the Six-party talks have not worked for more than a dozen years. Initiative a coop – not enough time and to risky even if N. K. elites would go for it. Sign more meaningless treaties and agreements – useless and empty. Cut North Korea off from the rest of the world – it will not happen or solve their nuclear buildup. Launch a full scale UN approved joint action to take care of the country and their 42 launch sites; while bring all the people into submission and funding their reconstruction afterwards – most likely to risky, and even if could pull off an Iraq like invasion (Saddam did not have Nukes), there would still be the trillion dollar military and reconstruction cost. Poison him to look like heart attack – best option, followed by pressure for elections and denuclearization. Assassinate him with snipers; with or without Joint Fleet and Ground Forces ready for takeover.